Views from every room in the house. Breathtakingly peaceful water views of possibly the most beautiful part of Lake Macquarie. The four bedroom house is a spacious 300 square metres and has a fresh and colourful decor. Around the house is 2600 square metres of lawns and gardens. 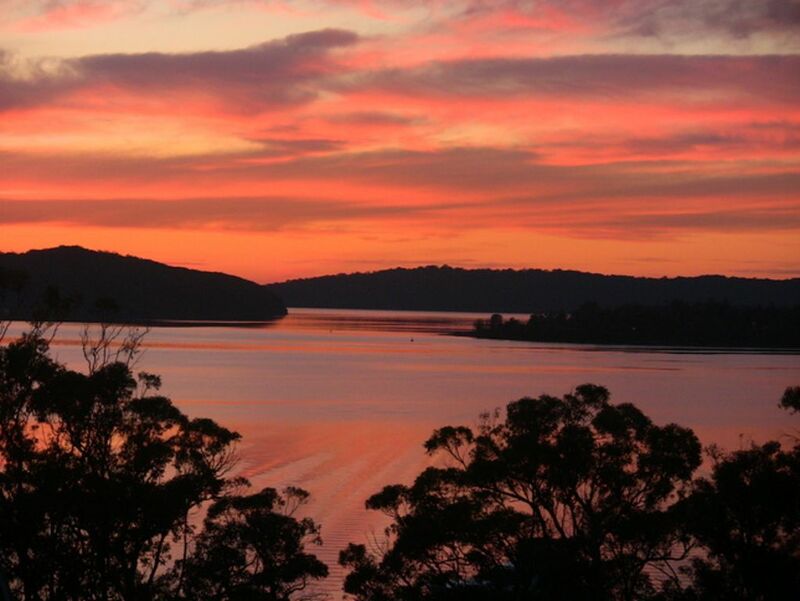 The property is right on the waterfront of Lake Macquarie. The house is quite private from most neighbours. *shady lakeside waterfront to rest or stroll listenning to water gently lapping the shore while feeling a cool gentle breeze. *walking tracks go for several gentle tranquil kilometres along the waterfront shore, directly accessible from this property's waterfront, no roads to cross. *fill your lungs with fresh cool lightly salted air. *splash around in the warm lake water. * Astonish yourself with magnificent memorable sunrises and sunsets and moonrises over the lake. * four generous sized bedrooms, two with queen bed, the third with a queen bed and single and the fourth with four single bunk beds. * large sheltered outdoor dining and BBQ area overlooking the Lake. * open plan glass wall living rooms with 270 degree views over the Lake and trees and lawns and gardens. the TERMS and CONDITIONS below these guest entries. "There are many pleasures in life, it has been my pleasure to meet you both." Ernie Dingo, 'Great Outdoors' 2005.
the terms and conditions below before confirming your booking. TERMS AND CONDITIONS: 'A Lakefront House Escape' Self-catering Furnished Accommodation. Deposit is required to secure the booking. Client cancellation more than 90 days before booking date: full refund. Number of Guests/visitors should not exceed the number stated on the Confirmation Notice or subsequently agreed in writing or email. Extra guests $275/week booking and $120/wknd booking. A total maximum of 8 guests allowed. No smoking is allowable in/at the house. Breach-Additional cleaning and deodorizing charges will be imposed. The house is only for the use of guests on the booking. Large Parties, Functions, Engagements, Weddings and Receptions are strictly prohibited. The local Council regulations clearly specify with this house- large parties/ functions/ weddings/ receptions are illegal and an annoyance to neighbours etc. Breach may result in loss of your bond and additional payments and council fines. Any damage, breakages, theft and loss identified during the stay or on check-out are the guest’s responsibility this includes anything obstructive or damaging put down the sinks, toilets or drain holes; also guest’s must ensure that nothing is done during the stay that may prejudice any insurance policy or warranty or increase the premium payable under any insurance policy held by the owner. Charges may be imposed for costs, repair or replacement of any such items. Departure - the property should be left in a similar state to its condition on arrival. The check-out guidelines provided in the guest information folder located in the front foyer are to be followed to ensure this occurs. Check-out time is 10 am to allow time to prepare property for next guests. All rubbish and garbage needs to removed from the house and disposed of correctly in garbage bins provided. Bins are to be left on the curbside of the road on check-out and on Tuesday pm if staying that night. Any garbage over and above what fits into the bins is to be removed by the tenant from the premises on check-out. Additional charges will apply if excess rubbish is not removed. The $500 bond will be refunded within 7 days in full subject to the above conditions being met. The balance of the rental amount is due in full 30 days prior to occupancy/booking dates. If not paid then the owner has the right to cancel the booking and re let the property. Included: Beds required made up with fitted and flat sheets, pillows and slips/covers, bath towels, blankets, doonas, doona covers, bath mats, kitchen towels and detergents: these are all provided. All beds used must have two sheets and pillows must have slips/covers. Beach towels are not provided. Also a standard exit clean after checkout is included. Extra cleaning over the usual standard amount, if required: $45/hour. Pets are not allowed under any circumstances in or on the property. Guests agree to occupy a lakefront house premises and use its contents at their own risk and hereby release, to the fullest extent permitted under the law, the owner and reservations manager and agents from any claims arising in connection with the house, the premises or surrounding grounds or contents. The guest is to indemnify the Owner and agents against any claims made by any other person or entity in relation to the booking period . The owners will make every effort to ensure the property is available as booked. However the owners reserve the right to make alterations to bookings due to extreme unforeseen circumstances. Great property with fantastic views and location. Luckily the owner has the correct address on the map as I couldn't get in contact with anyone the week of the rental to confirm this. I'm not sure what would have happened if anything went wrong in the first couple of days on the stay as they were not contactable for the first couple of days with no alternative contact given, but it didn't and we had a brilliant stay. Would definitely stay again. 'A Lakefront House Escape' was truly the escape we needed. The view of the lake shimmering in the sunlight greeted us every morning. The house had everything we needed for our long weekend. It was clean, comfortable and the owners were a delight to deal with. We enjoyed our first stay there so much we went back for a second. Thank you! Had a great stay at A Lake Front House Escape. The owners were great to deal with and answered all questions prior to the stay. The house was larger than anticipated and kept in great condition. Perfect spot to be close to the lake and not far from amenities (Supermarket, Food places…etc). I highly recommend this place, extremely great value for money and would happily return. What a wonderfully tranquil setting and well rennovated space. We were able to unwind and relax even with four young children running around. Thank you, we all had such a great time. We had a wonderful time at the Lakehouse. Everything was there that we could possibly want and we were very comfortable. It was nice and close to Bonnells Bay Shopping Centre which made buying our necessities very easy. The house was lovely and clean and well maintained. Thanks for a great place to stay. The Lakefront House was everything described and more. My family of children and grandchildren had a ball, even though the weather was not good. The house was fitted out with everything you could think of. Owners were very accommodating and we will be back!